As a lucky owner of Android smartphone and Mac OS computer you probably know that transferring files between these devices directly is impossible - macOS won’t show you Android folders as Windows computers do. So since Apple doesn’t offers any built-in options to transfer files from Android to Mac and from Mac to Android you should use third-party apps for that. In this article we’ll cover the most easy way of transferring files between Mac OS X and Android using SyncMate Expert utility, an app that gives you full access to Android folders directly in Finder. SyncMate as an Android file transfer utility. Establishing connection between Mac and Android. Mount your Android as macOS disk. How to transfer photos from Android to Mac and vice versa. How to transfer music from Android to Mac and vice versa. Transferring folders and files between Mac and Android. SyncMate Expert is a powerful tool that can not only transfer files from Mac to Android, or transfer files from Android to Mac, but sync data between these devices as well. Yes, SyncMate Expert is in fact a synchronization tool (sync and file transfer are not the same) and we’ll highlight the full list of its sync options a little bit later in this article, but with its unique “Mount disk” option you can connect Android as Mac OS X disk and work with Android content directly via Finder. It is that easy: connect Android to your Mac -> mount Android as macOS disk -> Android folders shown directly in Finder. 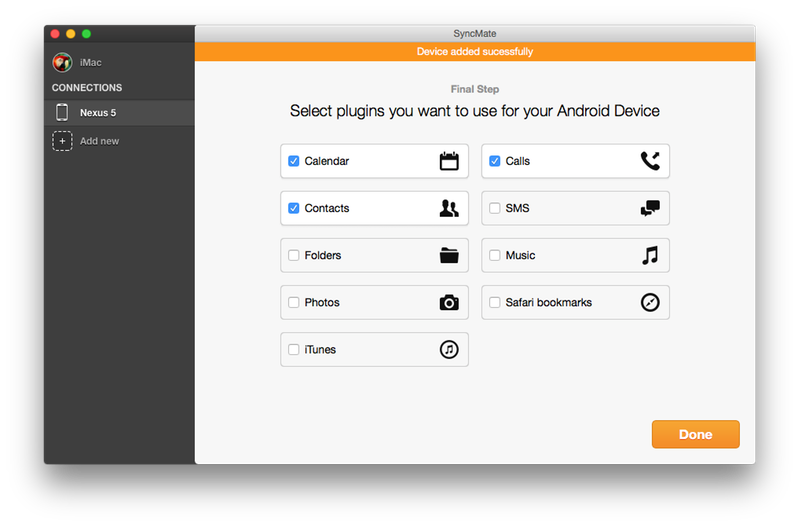 SyncMate requires OS X 10.10 and is compatible with Android 4.x-9.x devices. 1. Download and install SyncMate Free edition on your Mac. Launch it. 2. Once launched, click “Add new device” option in the left panel of the main window. Choose Android device in SyncMate wizard. 3. 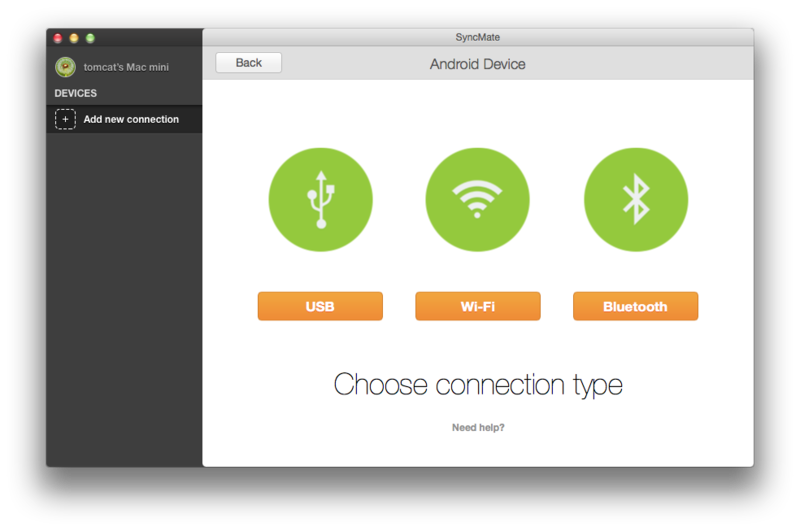 SyncMate offers you 3 types of Android to Mac connection - over Wi-Fi, Bluetooth, or via USB. Our advice - choose USB cable for the first connection (SyncMate will automatically send and install Android module on your device). If you prefer over the air type of connection - you’ll have to install SyncMate module for Android from Google Play. 4. That’s all. If you faced any problems while connecting Android to your Mac, please, check this article, it gives you step-by-step description of connection process. Alternatively, email our support team at support@eltima.com. 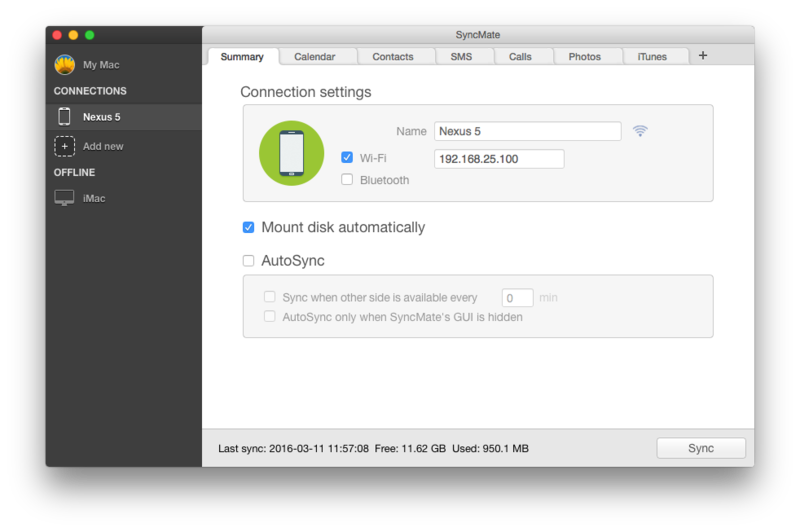 Once your Android is connected to Mac, go to SyncMate’s Summary tab and you’ll find “Mount Disk” option there. Enable it and all Android folders will be shown in Finder. Please note that “Mount Disk” option is available in Expert edition of SyncMate only, so you’ll have to upgrade your Free edition to transfer files from Android to Mac or from Mac to Android using SyncMate. “Mount Disk” option will show not only Android internal memory folders in Finder, but will also give access to any other external storages, connected to your Android (SD card, USB storage, etc.). 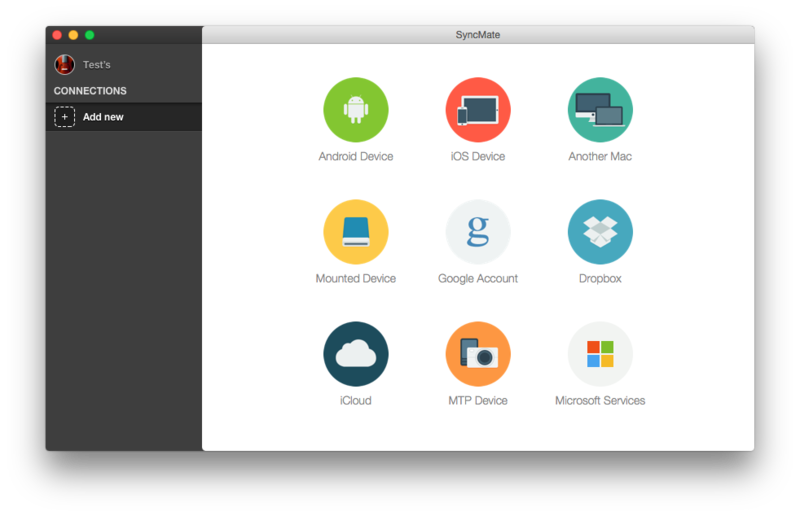 We wish SyncMate could give you access to Android system folders as well, but due to differences between Mac OS X and Android OS and the absence of any built-in mechanisms that can make connection of these devices possible, this option is not available for now. If we are talking about transfer (simple transfer, not synchronization), here is what you need to do to transfer photos from Android to Mac and from Mac to Android. 1. In this case we’ll use “Mount Disk” option of SyncMate Expert. Connect your Android to Mac and check if “Mount Disk” option is enabled for your Android (In SyncMate’s “Summary” tab). 2. 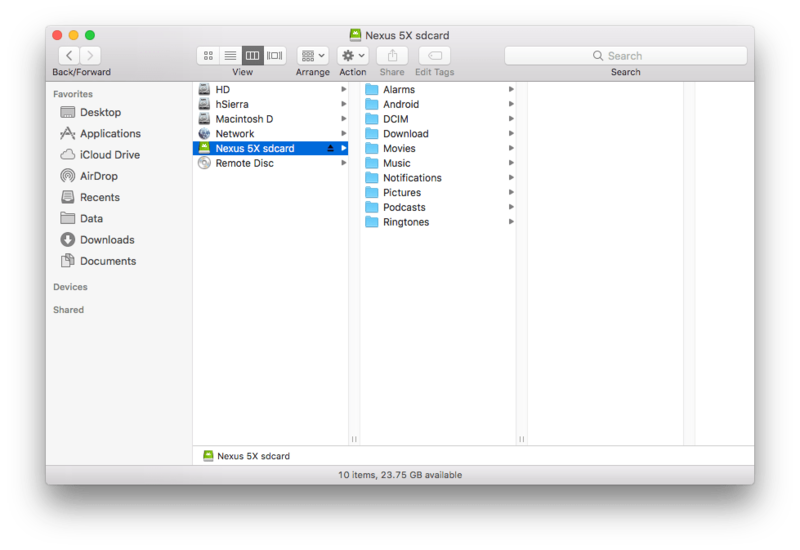 In Finder you’ll find Android along with all of its folders in the list of Mac OS X disks. 3. That’s all. Just drag photos from Android folder to Mac folder, or vice versa. 4. If you need to create a new folder on Android to transfer Mac photos in it - just create it directly in Finder. And if you need to sync photos (not just transfer them, but update on both sides) between Mac and Android, you should take a look at SyncMate's Photos plugin. 1. Go to SyncMate and connect Android to your Mac. 2. In SyncMate’s “Summary” tab check if “Mount disk” option enabled for your Android. 3. Now go to Finder and you’ll see Android in the list of macOS disks. Choose folder you need to transfer music to or from and move it as needed. 4. You can also create new folders on Android directly in Finder. Just in case you will need them. SyncMate allows syncing playlists as well, but that is done in iTunes plugin, not via “Mount Disk” option. If you need to sync separate tracks or whole playlists (not just transfer data, but update it both sides respectively), you should take a look at Music and iTunes plugins. To transfer files or whole folders from Mac to Android or from Android to Mac follow the same steps as in previous cases. 1. Launch SyncMate and connect Android to your Mac. 2. Make sure that “Mount disk” option is enabled for your Android (go to SyncMate’s “Summary” tab). 3. Now go to Finder and you’ll see your Android phone in the list of Mac OS X disks. Choose folder you need to transfer files to or from and move data as required. 4. If you need to transfer a whole folder - just drag and drop it. Or create the new one on Android directly in Finder to transfer files to it if required. And of course, syncing folders is also possible, check SyncMate’s Folders plugin for more details. SyncMate is a powerful synchronization software for Mac that supports almost any data sync between macOS and numerous offline devices and online accounts. What makes SyncMate stand out among other sync tools? Well, to start with, there are very few solutions that offer to transfer data between Android and Mac OS X. Especially now that several years ago Apple has removed their built-in Sync Service that so many of such applications relied on. Many simply ceased to exist. And since file transfer is far more complicated than it might seem, you won't find many apps offering such services, and even less of them will actually be working properly. SyncMate allows syncing contacts, calendars events, images, videos, music and playlists, Safari bookmarks, whole folders with files and lots more between Mac OS X and supported devices and accounts. SyncMate will sync data on your Mac with iOS devices, other Mac computers, online accounts and storages (iCloud, Google, Dropbox), Windows services (Outlook, Office 365 Home and Business editions). Hope this article was helpful and you'll choose SyncMate as your solution to transfer files from Android to Mac and from Mac to Android.